You are currently browsing the tag archive for the ‘provision’ tag. Paul encourages us to not look to our pay cheque or our boss for our provision and security but to trust the living God who gives us richly all things to enjoy. 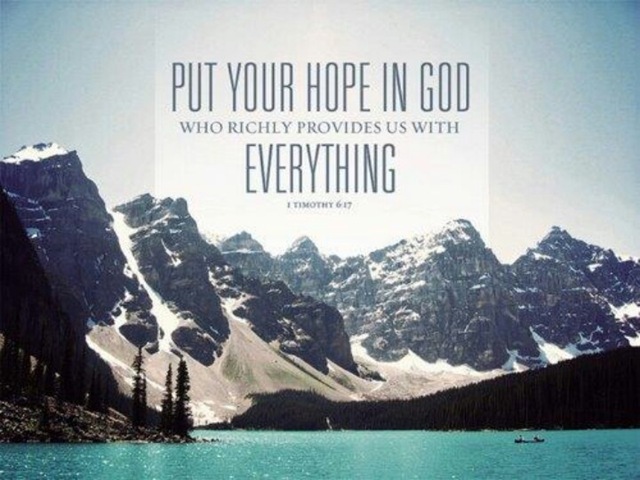 We need to put our hope in God who richly provides us with everything. He then goes on to unpack what our response should be to such undeserved favour. The flow on from this is that we will be rich in good and storing up eternal rewards. at The River we want to live with our eyes firmly on the prize. We want to live with the big picture in mind. We want there to be meaning and significance purpose in our lives. 1 Make good things happen with our money, put it to good use, get a god return for investment made. 2. Be prepared to give, prepared in mind and heart and attitude so that you’re a cheerful giver, full of faith in the greater plans of God. 3. Be willing to share, having a loose territorial hold on your money, knowing that God can use ordinary people and their willingness to share in remarkable ways. God is an on purpose God. If you feel led to give and share, here and out there, do it. Last year on the street outreach oliver and I met a woman who was down on her luck in a big way. She told us her story and let us pray for her. Tears rolled down her face. after we left I felt we should go back and take food from our food bank… Plus a little extra the money machine gave me. We drove back and delivered love in action, not just words to her. She cried again and using colourful language said you have no idea how much this means to us. Let them do good… Be ready to give, be willing to share. Each Sunday you have this opportunity. Our church is ready and willing to do good stuff, not only that will bless and benefit you, but will reach the lost, help the broken, build the kingdom. The offering is an opportunity for you to respond to God’s great generosity and to surrender to His Lordship and to contribute to the good things He is doing through The River. You are investing in your heavenly future as well as blessing your present. Therefore David blessed the Lord before all the assembly; and David said: “Blessed are You, Lord God of Israel, our Father, forever and ever. In our lives we sometimes wonder if God is aware of where we are on the journey…. Did God not realize they had no water there? Did he not check his map or google earth before stopping the cloud of his presence? Did he forget to check the list of required “stuff” at this location? Was God not aware of the needs of the poeple? God sees all and knows all. He was fully aware of where HE was and where the people were. He totally comphended the needs of the poeople. He knows OUR needs and sees where we are in life. He knows the desire of our heart. There was a bigger picture at work – a purpose for the poeople to stop at Rephidim. God was teaching them to have faith in him and to trust him and to follow him and to see the wonders he could work. He is the almighty God who parted the sea and provided manna and quail. He is the God who delivered them from Egypt and slavery. How did the people respond? With faith and prayer? No – they complained and dissed God. THey did not trust him. Where are you at in your journey? Are you in a place with streams of water? Are you in a dry and thirsty place? Do you have a job? Are your relationships going well? Are you healthy? Are you feeling fulfilled? Are you fixing your eyes upon Him and His might rather than looking at your circumstances? Trust in the Lord Your God wth all your heart, all your mind, all your strength, all your understanding and dont rely on your own understanding of life. paul counted all the comfort, succes, greed and potential reward in the community – it was all counted as dung compared to knowing God and he sacificed all to that end. he gave up the status and prestige of his position to know jesus. he had one passion and one devotion and that was jesus. he laid down in response to his Lord who gave his own life on the cross that paul might truely know God. philippians 3:12 Not as though I had already attained, either were already perfect, but I am pressing on, if I may lay hold of that for which I also was taken hold of by Christ Jesus. 13 My brothers, I do not count myself to have taken possession, but one thing I do , forgetting the things behind and reaching forward to the things before, 14 I press toward the mark for the prize of the high calling of God in Christ Jesus. what is the true prize of life? knowing God. this is a day by day growing relational experience. each day we need to make conscious choices FOR God, to obey, to pray, to seek him, rather than do our own will. we press on forward in relational intimacy and holiness (the outward expression of the holiness Jesus has already given us at salvation) and doing the will of God, big picture and little picture. there are times we falter, fail – have bad hair days, but we need to get up, ask and recieve forgiveness (and forgive ourselves) and just continue drawing near to God. God is the Creator of the universe, of all things. he calls the sun up to rise, the birds sing praises to him, he knows all the names of the stars. his love is everlasting and grace abundant. this is the God we serve, who cares for us. it is out of HIS riches, not our limitations, imagination or sources. his word promises us that he will care for us… his eye is on the sparrow, and he watches over me…. another WOW verse. God is at work in our mind and heart to cause us to desire to do the things of God. he placs in us a desire and will not only to obey him but our desire, our dream, our want is to do that very thing. that is why when considering the big picture call of God we need to ask ourselves ‘what do i naturally lean towards and want to do’. God makes us willing to serve him. as christians we are called to be demonstrations and an expression of God on earth – to be lights and witnesses. our behaviour must reflect this. our beaviour should reflect outwardly the inward fruitful working of the Holy Spirit. murmurings and disputings are mostly negative behaviours, coloured with bitterness, rudeness, pride, anger… are these things characterisics of God? no. likewise they should not be habitual characteristics of christians. we need to be people that give hope, love, grace, forgiveness and encouragement. words have power. use our words wisely, to build, not tear down. we need to ask God, and then partner with the Holy Spirit by choice and will to place a guard on our mouths, so we speak rightly, thus shinning well. Yesterday I was blessed to tag team doing the service leading for our Sunday morning service. A guy did the notices and I did the offering after the worship – so that was great – he is just starting out so they were easing him into the role. I love doing the offering segment – it is just after worship so you kinda carry that on and share about why we give and then that is that. Every fortnight we also have communion. Isaiah 58:6 Is not this the fast that I have chosen? To loose the bands of wickedness, to undo the heavy burdens, and to let the oppressed ones go free, and that you break every yoke? Is it not to break your bread to the hungry, and that you should bring home the wandering poor? When will you see the naked and cover him; and you will not hide yourself from your own flesh? Our offering is a pracitcal means to starting the above – to loosing the bands of wickedness etc. It is something we can all be involved in and do. The bit we give all goes into doing the work of God. That is a good reason to give eh!